As I left Orleans for Beaugency, I walked at the pace of the river to the rhythm of the children's song. All day long the Loire was on my left. Some of the willows on the bank were dead or dying under the stranglehold of the mistletoe. At times I walked past little backwaters away from the main flow, and expected to see Rat and Mole messing about in boats. To the right were parks, campgrounds, backyards with barking dogs, the occasional chateau, fields of barley with the wind wafting across in waves, and even a lonely fisherman in a narrow lagoon. It was a day of dogs. First, a succession of poodles followed by their masters and mistresses, gruffling and scuffling and snuffling along, enjoying one another's company. And then from behind a fence, larger mastiffs, hurtling towards me, "Avaunt, thou scurvy knave. Begone!" But dogs are usually friendly when they are out walking with their master. I met some happy labs who had been swimming in the Loire. One looked at me hesitantly, and when I clicked my tongue, bounded at me and smothered me in kisses. Or would have done, had his, or her, master not rescued me. It is difficult these days, for obvious reasons, to tell whether a dog is male or female. Frequently, I say "he" and am corrected to "she". And vice versa. I remember once in Brittany encountering a dog whose identity was not in doubt. He had not been neutered, and was walking about town with his mistress. They made a curious couple. She was quite beautiful, but he was by no means handsome. His testicles did not hang true, but were twisted and stuck out at an odd angle, without any covering of hair to protect his modesty. How the village lads must have laughed! I often wondered whether she was aware of the spectacle and indifferent to the ribald comments which must have followed, or was deliberately flaunting her dog's unfortunate appendage, secretly amused at the puerile sense of humour displayed by the male population. I felt sorry for the dog. Next I met an older dog of indeterminate ancestry who had also been in the water. Her master and I fell a chatting, and when I asked for directions to the nearest bar, he invited me to join him for coffee at his house. He, like everybody else I meet, knew people in Canada. His daughter was a former teacher and a trained chef, and was now cooking for workers at a mining camp in the Yukon. How they must love their meals! He took me on a tour of his garden and introduced me to his pet chook. His name, not the chook's, was Jean-Francois Legare. A very common name in Quebec, he said, but rather rare in France. It was a very pleasant interlude. I am staying tonight in Beaugency at another cheap hotel, the Auberge Maille D'Or. Even at 39 euros, it's not the cheapest -- the kind lady in the tourist bureau hinted that I might not like that one -- but it's comfortable and has character. I am up in an attic in what would have once been the staff quarters, with wooden beams and sloping roof. Or it may have been the apple tree. Eastertide has been and gone, but the season is so late this year, that perhaps it was the cherry tree after all. Jean-Francois told me that he had to put a plastic covering over his potatoes to protect them from unseasonal frost. In any case, the blossoms, white and pink, assailed my senses as I left Beaugency in full sunlight with hardly a breath of wind to oppose me. And it was well there was no wind. Across the river loomed a nuclear power station with its cooling tower sending a huge plume of steam straight up into the air. Yesterday's wind might have blown some of the effluent into my face. It was an image of ugliness, but then I needed to charge my gadgets, didn't I. Oblivious to the nuclear threat, a white swan swam on the waters below. And on my side of the river, tiny little white flowers lined the verge along with intermittent buttercups and the occasional poppy. Above the chirping of the birds in the woods I could hear the cooing of the doves, and when I crossed the fields, I heard my first cuckoo. I passed a lowly donkey, and some horses nuzzling together under a tree. For much of the day I followed the horizontal red and white markings of the GR 3, until it took off across the river on a short cut to Blois. I arrived at Suevres early in the afternoon, my estimation of the distance matching, for the first time, that of the guidebook. I visited the 12th century Eglise Saint-Christophe, sitting solidly on its Roman pillars. On the outside, I admired the gargoyles which had survived remarkably well despite stretching out into the elements. I always find gargoyles interesting as they often reveal the earthiness of the workmen themselves. 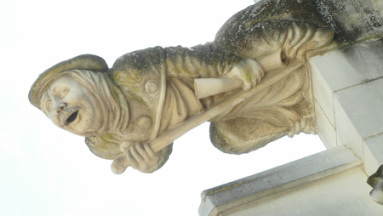 Some of the sculptors had a crude sense of humour, and on the outside of the church seem to have got away with profanity that wouldn't have been permitted on the inside. Perhaps they were unsupervised, or perhaps the authorities thought it wise to turn a blind eye. Often their taste turned towards the carving of male genitalia where they were certainly not necessary to the religious message. I have seen them in Spain, quite unattached, but in this particular case, they adorned one of the grotesque animals. In their youth, these workers would have been the village lads I mentioned in the last post. I think they also got a kick out of carving some of the grotesque human figures in the likeness of someone they knew. They probably enjoyed depicting evil in the form of a person they particularly detested, such as a miserly merchant or a licentious priest. They must have had someone in mind when they carved the human figure with the moustache. What a pained expression on his face! This year I am wearing woollies. At a Camino presentation in Victoria, Gail Robinson and a colleague from a local outdoor store praised the deodorant qualities of wool. They spoke of their experiences of wearing wool for a week without washing it. "It won't stink," she said. "You might, but it won't." So far, so good. I'm not washing every day when I arrive, as I used to do. Mind you, it hasn't been hot. In fact, it's been bloody cool. I could do with my faux-Patagonia down sweater, which I thought I wouldn't need. But the word is that it gets warm once you cross the Loire. I'm still on the north side. I am staying at the Hotel de la Providence at Suevres, demi-pension at €46. Very comfortable, with an excellent evening meal, full menu, generous portions, and wine included. I like these cheap hotels, but some people wouldn't. They are very basic, and there's always something wrong in the room, such as a nasty stain on the floor, a lamp that doesn't work, a toilet flusher without a nob, a shower hose without a wall fixture, or a sink without a plug. So I have become quite adept at showering with one hand or using a sock to keep the water in the basin when I wash my clothes. But the bed is comfortable, the room is quiet, and I usually have a good night's sleep. After a generous breakfast with coffee made by hand, I wended my way down to the Loire. Women walked by with their dogs. A workman cut the nettles along the verge. A man was performing his tai chi, or praying to the Great Spirit of the Loire. I fell into a reverie myself, and imagined this path in the past, kings travelling from palace to palace, nobles riding by on horseback or, as Dickens would have it, in a coach, running over a hapless child and dispensing a few coins in recompense. I have been rereading Dickens and finding it a little disappointing. Those insipid female characters like Dora and Florence, so silly and weak, even for Victorian times. Give me Dorothea or Emma or Elizabeth instead. Even the heroines of Mrs. Gaskell, an admirer of Dickens, had more backbone. I walked under a massive viaduct which filed in from my right, but then stopped short. Another bridge to nowhere? The folly of a rich nobleman who had constructed an elevated walkway for his morning stroll? My speculations were put to an end by the next person that I met. The lady explained that the viaduct had in fact carried a railway line across the Loire. It had been bombed during the war. Indeed, I looked back and saw the lonely pillars standing in the river. She too had been to Canada, and had travelled on the Rocky Mountaineer, and visited Victoria and the Butchart Gardens. Very British, Victoria, she said, not the first person to make that comment. We agreed that it was truly a glorious morning, and I expressed my hope that perhaps it marked a change in the weather. She made that characteristic French gesture with her hand that expressed her doubt. She was right, as it turned out. Until now, we have been well regarded by Europeans, but we should remember that they are well aware of our tar sands, which have probably replaced our unfortunate slaughter of the seals as an object of their disgust. While they try to control their emissions, we in North America pollute the air they breathe and mess up their climate. A majestic troop of white swans swim out of a backwater towards a string of islands. Pink and white blossoms stand out against the green of the woods. A cuckoo sings incessantly. Why is the call of the cuckoo such music to my ear? Why is the sight of the swans so pleasing to my eye? Why does this vista of sun and sky and woods and river fill me with such a feeling of well being? Surely we are meant to live in harmony with nature! When I see the dogs playing and the lambs gambolling and the horses nestling together, all taking such pleasure in one another's company, I wonder, can all this be the result of chance? Evolution does not explain to me the beauty of Nature or the joy of Living! It was a wonderful walk on a glorious morning. As I arrived in Blois, I noticed high on a hill a quite attractive modern church which made me think that not all contemporary ecclesiastical buildings have to be like those utilitarian glass temples which surround our cities in Canada. The church turned out to be my destination, the Foyer de Notre Dame de la Trinite. At the Acceuil I was attended to by a young woman with such a disturbingly low neckline that I had to lift up my eyes unto the heavens. Quite a sight in a Catholic retreat! And hardly fair to the celibates. Or was this the modernization of the church? I walked down the hill into the centre of town. On the way I ate the plat de jour on the terrace of Le Denis Papin. It was a pastille de canard, a superb dish, a kind of pie made of lentils and minced duck. I stopped at a magnificent building to admire some ornate carving. "It's a private home," said a man." 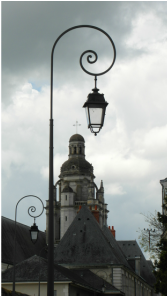 We have such beauty everywhere in Blois." Indeed they do! Then I visited le Chateau de Blois, that amazing quadrangular palace with its wings constructed in different architectural styles, the seasonal home of Francois I and Henri II. Afterwards, I sat and drank a beer at a bar overlooking the chateau. And then the wind almost whipped the umbrellas off their stands and it started to rain. I took my beer inside. I cannot recommend the Foyer Notre Dame de la Trinite. The breakfast consisted of a few slices of stale bread and a stale croissant. Surely someone could have walked a few yards to the bakery? And the Wifi didn't work and nobody cared. And there wasn't a socket in the room to charge my gadgets. So I cannot recommend the Foyer Notre Dame de la Trinite. If there's one meal that the Brits do well, it's breakfast. I can taste it now, bangers, bacon and eggs, occasionally some black pud, or some haggis if you're in Scotland, tomatoes, even some fried bread, and lots of toast and marmalade. And tea or coffee. I'm not saying it's healthy, but it tastes bloody good, and it sets you up for the day. That's why it's called the full English breakfast. For all the superiority of French cuisine, their breakfast pales by comparison. It's as if the French have decided to throw in the towel and devote their energies to the important meals later in the day. ("Let the biftecks win the first round. We will win the rest! ") The result is a meal that needs no preparation, just a quick trip to the bakery to buy a baguette. That's why the bakery opens at seven, even on Sundays, and why the stereotypical Frenchman has a baguette under his arm. The French breakfast, therefore, depends on the quality of its bread. So it's really bad form to serve stale bread for breakfast. Sometimes it's unavoidable, if breakfast is served before the bakery opens, for example. But then the bread is toasted. Which is the only way to eat stale bread, isn't it? I was really disappointed in the breakfast at the Foyer. And it's no excuse to say that this was a religious establishment. You can bet those loaves in the Bible were fresh! As I walked by the church on the way out, I noticed a sign saying, "No begging". What would Jesus have said? Or Pope Francis? On the path I met not a solitary soul. I crossed the Loire, walked along the stone bed of the old tow path, and then cut across the broad plain which bordered the river, making my way between fields of barley and wheat. The sky darkened, and even the birds were subdued under the threat of rain. I passed through the hamlet of Aumone, and then stopped for a coffee in the village of Cande-sur-Beuvron. There it began, lightly at first as I raced along the final six kilometres, but then more heavily, and by the time I reached Chaumont it had become a downpour. I was drenched, and left a puddle on the floor of the Office de Tourisme, where I popped in to find somewhere to stay. Tourists had taken all the bed and breakfasts, and I was lucky to get the second last room of the hotel. The rain has continued non-stop since I arrived, so I've decided to give the chateau a miss. I decided to wear leather this year. Last year I wore Keens Gypsums, and got blisters and wet feet. So I bought a new pair of Zamberlans, and today my feet were dry. And they were solid on the stony path. And so far, no blisters. Who is the nasty, cross lady, Mama?Hush, child, she's a witch. I woke up this morning to blue skies, but by the time I left the hotel it had clouded over again. As I walked through the village of Chaumont I caught a glimpse of the castle I had missed the day before. After walking along the highway for several kilometres, I took a little road up onto the plateau, where I saw my first vineyards, extending on both sides almost as far as the eye could see. Perhaps these were the grapes that had produced the vin de pay I had enjoyed last night. I arrived at the little village of Rilly-sur-Loire and rejoined the main road. Half an hour later I walked into Mosnes, one of those linear French villages that stretch out forever. Eager for my first coffee of the day, I was directed to to a bar which was supposed to open at ten o'clock. I arrived on the dot. It was closed. At five past, I tapped on the door. A woman appeared. "No need to knock on the door," she said, clearly annoyed. "J'arrive." She plonked my coffee on the table, and when I paid, brought me my change without a word. No merci or au revoir or bonne marche. Not a word. I have written before of the effect that "those little, nameless, unremembered acts of kindness" can have on the recipient. The reverse is true as well. This was the first case of rudeness I had encountered in France. It rankled. I hurried off. I was in no mood to tarry. Perhaps they were all as miserable as her in that place, without a chateau to bring fame to their little village, halfway between the tourist towns of Chaumont and Amboise. Bugger the guide, I said. I'm heading straight down the main road. By now the traffic was increasing, and I had to move out of the way of the oncoming traffic on to the verge. Unfortunately, nettles had already claimed it as their own. But I soon cheered up. Some cyclists rode by and greeted me as a fellow traveller. They, too, were on their way to Saint-Jacques. Then a couple of 2CVs honked their horns in encouragement. That happens a lot. I walked on. Always the Loire to my right, and to my left, great limestone cliffs with caves hollowed out of the rock. This, I assume, was the origin of the word for the cave, the wine cellar in the basement of every French home. Originally, wine had been stored quite literally in a cave, and the word had stuck. Now some of these caves were open and elaborately furnished inside, with signs in front which said, "Visite. Degustation. Vente." I was sorely tempted, but I wanted to reach Amboise before the rain. I took a little detour off the main road into the village of Chargé. Villages sprang up for a reason, on a river for the mill or on a hill for fortification, or perhaps at the crossroads for the trade. The little village of Chargé clearly exists because of the wine. Numerous caves extended back into the cliff to store the wine from the grapes that grew on the plateau above. Perhaps the wine had then been shipped downstream to the coast. Perhaps the very name derives from its role as a loading place. Or perhaps the wine had been shipped out by rail. The main railway line which serves the towns along the Loire runs along the north side of the river. But there must have been a line on the south side as well. Abandoned, the little station of Chargé stands alone. I then continued down the highway into Amboise, a town that grew up at the foot of its great castle. I am installed at the Hotel le Francais in a room on the second floor "with a nice view of the Loire," he said. Indeed there is, in the distance, beyond the car park and the tourist buses. Then I ate a salad at one of a long line of restaurants overlooked by the massive wall of the castle. In the afternoon I visited the chateau. Although it later became a royal palace, the site had long been an important defensive position with its commanding view of the Loire. In the garden is an impressive Lebanon cedar, planted in 1840. Leonardo is buried in the little chapel set back and between the tree and the palace. It's a very impressive royal chateau, but if I had to choose between the two, I would visit Blois. Everyone here is talking about the weather, how bad it is, how there hasn't been a spring this year, how it isn't "normal". Yesterday, a man stopped me on the bridge, and said, "Where is the sun, eh? Actually, it hasn't been that bad for walking, and I've only had one bout of serious rain. But it dampens the spirit. I set out into drizzling rain, glad of my zambs as I splashed through the puddles. My pack was heavier than usual this morning, perhaps because of the increasing number of tablets of hotel soap I am accumulating in preparation for my staying in gites later on. I always seem to leave my soap in the shower stall, so I wanted plenty of spares. As I left town, I noticed that it was market day. Merchants were buzzing around with umbrellas, setting up stalls, darting back and forth, unloading their wares, and even at half past eight, early-bird shoppers were out and about, looking for the worm. There must have been at least two hundred stalls, stretching out in a long line between the levee and the Loire, selling everything you could imagine: clothes, clocks, tables and chairs, gold and silver, books and paintings, linen, china, carpets, not to mention fresh fruit and vegetables. It's a wonderful tradition which seems to have survived the advent of supermarkets. Every town has its market, on a different day of the week to allow the merchants to move from one place to the next. I left the levee to walk along the main road, and then along a bicycle path with signs indicating the way to Tours. Wood smoke drifted from a chimney top as I arrived at the village of Lussault-sur-Loire. It was warmer inside than out. I resisted the temptation to have a coffee at a bar. I had a long way to go. You can't win when you're walking in this weather. If you wear just a tee shirt under the rain jacket, you get cold. If you wear something over the tee shirt, you get hot, and then you sweat, and then you get cold. I noticed some elongated islands in the middle of the river, running parallel with the current, in various stages of becoming solid land mass. Some were mere sand banks, covered in birds, with many more squawking overhead. On a few of the islets, vegetation had already taken root, and they supported a few young trees. Others were now well-treed like the mainland. Nature reclaims its own. Now it was time for a coffee. I walked along the footpath into Montlouis-sur-Loire and almost stepped on a very large snail. Hie thee hence, thou lone, lorn creetur, or thinks will go contrairy with thee. I dodged a couple of dog turds. A friend in France would call this a crottetoir. The English equivalent would be a "shitpath". Mind you, it used to be a lot worse. Thirty years ago you would barely find a bare space on the pavement to put your feet. The French have improved in other ways as well. Back then, if you ventured onto a crosswalk, you took your life in your hands. Now, the motorists sometimes stop for you. This morning, as I approached a crossing on the main road, a man came slowly to a stop, gave me a broad smile, and waved me across, much to the surprise and the annoyance of the traffic behind. He had probably walked the Camino. I stopped for a coffee. This was a friendly bar. Everyone said Bonjour as I entered, and Bonne Journee as I left. I pressed on. Finally I could see the spires of the cathedral de Tours in the distance. When I arrived, everything was closed. It was Pentecost. I found a hotel, and did my washing, even though I've decided not to stop the two days it would normally take it to dry in this weather. I have a hair dryer which is going to work overtime. I visited the cathedral, and there, occurred one of those magical moments which happen from time to time on the Camino. An orchestra was playing a very familiar introduction, and I felt I just had to come in with "Qui tollis peccata mundi". I think it was the Mozart Requiem, but it may have been the Faure. No choir, but a very good youth orchestra was practising for something. The cathedral is stunning, very large, Gothic, with an amazing array of stained glass on either side of the choir. I went back to my hotel, and went to work with the hair dryer. Back in Perth in winter in the old days, when I met my mum's friend Thelma out walking, she would say, "Hello there, I've just come outside to get warm." There was no central heating in Perth. I went outside to get warm, and found a restaurant. It's interesting how the servers always assume that I will have my beef well done. Which I do, of course. Not that it ever is. Blood is always oozing from a well cooked steak in France. Except tonight. I have learned that you get what you pay for when it comes to eating here. If you walk along the line of restaurants looking for what seems to be the best deal, you will end up with steak frites, with the steak as tough as old boots, and the chips better than the steak. That is the tourist menu. But if you pay a little more, say five dollars, you can eat superbly well. That's what the locals do. And tonight, so did I. 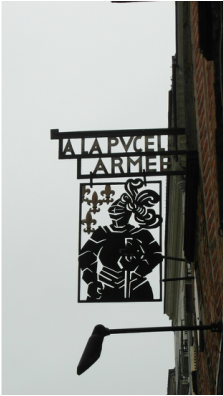 It was a superb meal at the Restaurant de la Ferme on the rue Colbert. And if I had to order a demi-bouteille because my usual quart de rouge wasn't available, so be it. So my advice to you is this: Never have breakfast at your hotel. Buy the bread and croissants at a bakery. Take them to a bar and eat them with your coffee. Put the five dollars you will save towards a superb evening meal. The French can teach us a lot about eating and drinking. And living! What can they teach us about living? Carpe diem. Eat, drink and be merry, for tomorrow we shall die. I have decided, after all, to spend a day in Tours. But I had to move all my gear, including my wet woolies, up a circular staircase to the 3eme etage, which, I remind North American readers, is the fourth floor. A better room for the same price, for only the hardy will climb three flights of stairs. Like other enlightened cities in Europe, Tours is installing its tramway system. Main streets have been closed down and turned into pedestrian ways with the tramlines down the middle. I wonder whether there was much discussion at the popular level, or did the elected officials simply make the decision because it was the right thing to do? In Victoria, our elected officials would have waited years before making up their minds, for fear of making an unpopular decision, and once made, the decision would have been challenged, and the protesters would have been out canvassing for a referendum. "What are we protesting against today?" "Dunno. Shut up. Just protest." I wandered around the old town. Tours must have been a big city, even in medieval times, because the vieux quartier is centred around its own church, a massive basilica, now in ruins, and some distance from the cathedral. The isolated wood and brick houses stand in the midst of more recent construction, but on one square I found the most magnificent stretch of half-timbered buildings I have ever seen. I wandered back to the cathedral, for I had given it short shrift yesterday. 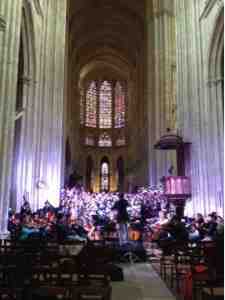 This time the school choir was practising with the orchestra, and it was the Faure Requiem, not the Mozart. I should have known that was what a French school would perform. And it was a young choir too, twelve or thirteen years and up. Like me, other visitors to the cathedral had abandoned their tour, and were sitting on chairs in the nave, enchanted. If you could have heard the magnificent strains of the Agnus Dei floating up into the vaulting above, and seen the children with the colours of their young faces and clothing against the magnificent medieval stained glass windows in the choir behind them, you would agree with me that there is hope for civilization. I do not believe that these children will be the same again after singing this music. From Paris to Tours I have not met another pilgrim. But this may change. Many will start from Tours rather than Paris, and indeed, I was not able to get my first choice of lodging for tomorrow night.